Trasher has been updated to build 3. There is only a few minor fixes and additions from the previous version. The installer is available here. The new Pro Tools 12.8 release is showing a small but annoying quirk. When the AAX Plug-ins Database is deleted and rebuilt through 12.8 install, it is taking multiple restarts for the entire plug-ins list to load. I modified Trasher to give a backup and restore for your AAX Plug-ins Database file. So before installing the 12.8 update, backup your AAX Plug-ins Database file. Then uninstall your previous Pro Tools build and install 12.8. Pro Tools will ask you to restart your computer after the install completes. After you restart, hit the “Restore AAX Plug-ins Database”. This will save the problems related to plugins not loading. This function is also included on the button that backups your different Prefs and Database files. A new small update is the ability to backup the Midi Maps and Presets folders for the Platinum Samples Accent Drum VI. The Ocean Way Drums library and forthcoming Galaxy Drums by Space Cabin Audio both sound excellent. I have been using them quite a bit and created this for myself, so figured I would go ahead and include it. Those are the only changes from Build 2. The button selection had to be changed a bit on the first tab, but it is minor at best. This version will work on every version of Pro Tools that is listed on the UI, so do not worry about not updating Trasher if you have an older version of Pro Tools version. If you are not aware of what Trasher does or can do, feel free to ask in the comments. 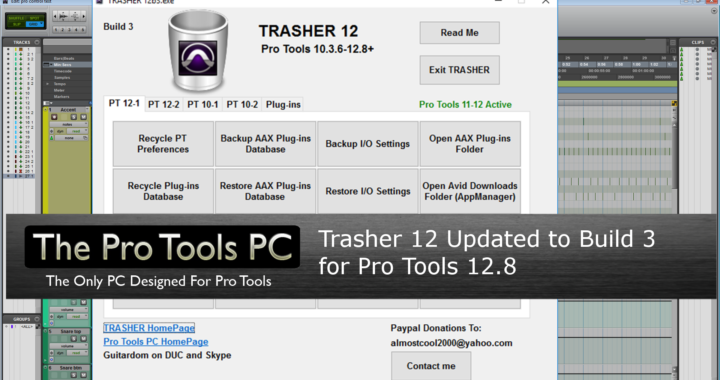 Posted in Free Support, News, Tech Support, updates and tagged Pro Tools, Trasher 12, Update, Windows, Windows 10.